Power cables come in 10 and 20 foot lengths that can be specified at time of order. Factory default is 10 ft. Cables will fit 5, 8, and 12 zone systems as well as stacked systems. 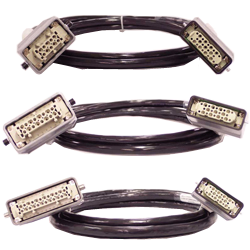 Machined pins in a 25 pin connector is used on both sides, male and female for the mainframe end and mold end respectively. Hoods are polled for single lever latch. Thermocouple cables also come in 10 and 20 foot lengths that can be specified at the time of order. Cables will fit 5, 8, 12, and stacked systems. 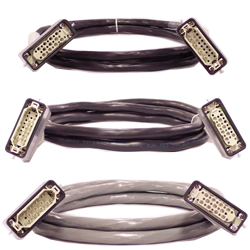 The mainframe end of the cable use a female 25 position connector using machined pins. The connectors of the mold end of the cable depend on the number of zones.